One of the things I like best about herbs is their simplicity. Most of the time they’re just completely no-fuss and relatively intuitive – especially in cooking. I’ve always been the type to never measure anything when I cook. Recreating recipes (or heaven help me when I post something) I have a stupidly hard time remembering what I did because I just guesstimate the heck out of every ingredient. Meticulous notes help…but that’s completely not my nature. 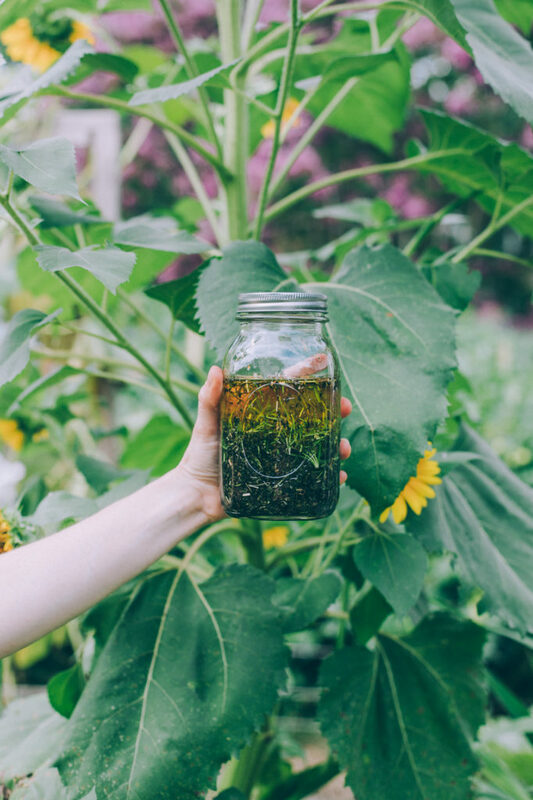 When I learned how to infuse herbal oils, I felt like I met my match. You basically have to measure nothing. It’s not an exact science, and always forgiving and ultimately super effective no matter the “dash of this” or the “handful of that” mentality. Oils are an incredibly good extractor of not only medicinal constituents, but of flavors. If you’ve never cooked with infused oils, it’s a glorious way to add subtle and aromatic tastes to your recipe. Nothing about this process is overcomplicated. Keep it simple, and don’t overt think the process. To infuse herbal oils, all you need is your herb of choice (I prefer single, aromatic and fresh herbs) such as rosemary, thyme, basil, tarragon or dill) and an oil that you like to cook with (I often default to olive oil). During the summer months, I reach for olive oil more than any other because I use it often as a salad dressing base, and when I infuse herbs into my olive oil holy smokes is it extra delicious. You can also experiment with sesame oil, macadamia nut oil, sunflower seed oil or avocado oil, however I prefer the infused taste of olive oil more than any other. Infusing culinary oils (in my method, anyway) takes absolutely zero measuring. Use any size jar you like, and when possible use fresh and very aromatic herbs in your infusions. Start with one herb at a time to get a feel for how strong you like each flavor, and then begin combing herbs for different flavor combinations. My personal favorite – rosemary and thyme. Chop your herb of choice as fine as possible. The more surface area exposed, the better the extraction. Fill your jar at least 1/3 full of the fresh, chopped herb. Cover completely with olive oil until your jar is at least 2/3 full. Cover with a tight fitting lid, give it a good shake then let sit in the sun for a solar infusion for about 3 days, shaking at least once every day. Once infused, strain out all of the herbs using a fine mesh strainer or cheese cloth and store the infused oil in a glass container out of direct sunlight. Enjoy on salads, or as a dipping oil in the summer months.